Watson Campaign Automation is the IBM solution formerly known as IBM Marketing Cloud/Silverpop. If you’ve been keeping up with Whereoware’s blog, you’re familiar with IBM’s Watson Campaign Automation (if you haven’t, you can check out our blog posts here). As an IBM partner, Watson Campaign Automation gives us different ways to track our audiences’ behavior and personalize their experiences. Today we’re focusing on one aspect of Watson Campaign Automation – Queries. Watson Campaign Automation is the IBM solution formerly known as IBM Marketing Cloud / Silverpop. Is Salesforce integrated with your Watson Campaign Automation instance? Great! But, as a marketer what does that mean and how does it impact the day-to-day function of your leads? We’re here to help. This week we introduce Internal Marketing Manager, Nora Luongo, to share her 3 things every marketer should know about their Watson Campaign Automation + Salesforce integration. When synching leads bi-directionally between the two systems or just from Watson Campaign Automation to SFDC, every record must have values for three fields: Email, Last Name, and Company Name. If these are left blank, the record will not sync over to Salesforce. If you do not know Last Name or Company Name put an X or another phrase to indicate it is a temporary placeholder and update it when known. Just remember, if you do use X or another phrase in these fields and you use these fields for personalization in mailings, you will need to put in safeguards to make sure the recipient doesn’t see the fake value. The CRM Integration Status Checklist catalogs all the sync agents that are currently enabled/disabled for your organization. Unfortunately sync agents are not stealthy secret agents, they are the kind of syncs that are set up to run between Watson Campaign Automation + Salesforce.com. Looking at the picture below, each of the categories: Profile Data for Leads, Contacts, and Accounts; Alerts to Chatter/Tasks; Lead/Contact Mailing History to CRM; etc. are all sync agents. Enable the ones applicable to your organization and disable any irrelevant agents. If you see green checks across the board and the last successful sync date/time is within 1-2 hours of checking – you’re good to go! However, if you see that you have green arrows, but the last successful sync was at 8 AM and you’re checking at 1 PM, this can indicate a sync stall; open a support case if you see this. Also, open a support case if you see a red exclamation point – this means the sync has stopped, indicating a bigger problem. The field mapping tab can be a bit confusing so let’s break it down. There are two tabs on the left: “Active Mapping” and “Working Copy”. Active Mapping is the default view and shows what fields are currently set to sync, one way or bi-directionally. Working copy is where you edit (add or remove) the field mappings. There are also 4 tabs to the right, “Leads”, “Contacts”, “Accounts”, and “Review”. If you click on Leads, Contacts, or Accounts you will automatically see their Active Mapping. Go to the Working Copy to make edits, then go to the “Review” tab (at the far right) to activate the new mapping(s). If you do not activate in the “Review” tab after making changes to your mappings in the working copy tab, they won’t save or show in Active Mapping. Alerts are used to identify contacts “flagged” with an issue. Unlike user created lead alerts, these are system generated alerts indicating why a record hasn’t synced. Using the “Search In Records” feature for a desired time frame, you can find if a specific record yields an alert. An alert may identify a contact with a missing Email, Last Name, or Company Name for example. Or that the campaign ID associated with the record is not the correct number of digits. If you do not understand how to correct the issue related to the alert, open a support case. The CRM settings are a great governance resource a lot of WCA users don’t know about. If you do not currently have admin permission, but you are the resource who would handle these items, request admin status from the current organization administrator. Did you know you can set Watson Campaign Automation forms to sync contacts on submit with Salesforce.com? Did you also know you can push those submitted contacts to a campaign in Salesforce.com? If you answered no to one or both – stick with me! In Watson Campaign Automation, go to the landing page that has the webform you would like to sync. Click directly on the form name and under Form Settings you will see the checkbox (default is unchecked) to “Enable sync record to CRM on ‘Submit’” and underneath that, two text fields relating to campaigns. Adding campaign information is optional, but you must have the checkbox ticked if you do add campaign information otherwise it won’t work. You can paste the campaign ID from Salesforce to the Default campaign code text box in the forms. If you would like to set the status of all contacts who submit the form and are added to the campaign, you can do that in the Campaign Status text box. Save and publish the landing page to activate. I hope my 3 things (okay, more like 5 things) to know about your Watson Campaign Automation + Salesforce integration were helpful. I learned from speaking with other marketers they didn’t know how to optimize or oversee their sync – they just knew it was set up. Hopefully knowing these items will help streamline your sync and save time in your daily tasks. Our intention was to make the IBM Marketing Cloud (IMC) simple by walking through use cases for each tool. Sounds like a no-brainer, right? The thing is, IBM has been developing the IMC for some time now – adding new tools, revamping existing products, and integrating them together in awesome ways. All the moving parts are tricky to track. Once you get the names straight, the powerful capabilities of the IMC are hard to beat. Together, they offer big and small-picture insights into customers’ activity and behavior across channels, so marketers can reach out at the right moment, via the right channel, and with a compelling message customers can’t resist. Today, we’ll give you a quick recap of how each tool is used by busy marketers to supercharge their campaigns. Download our handout, above, to see estimates of the cost, availability, and level of effort to install each tool. Thank you to everyone who joined us for our webinar: Simplifying the IBM Marketing Cloud Roadmap! We hope each of the tools make a little more sense to you + the use case for each tool for your organization. 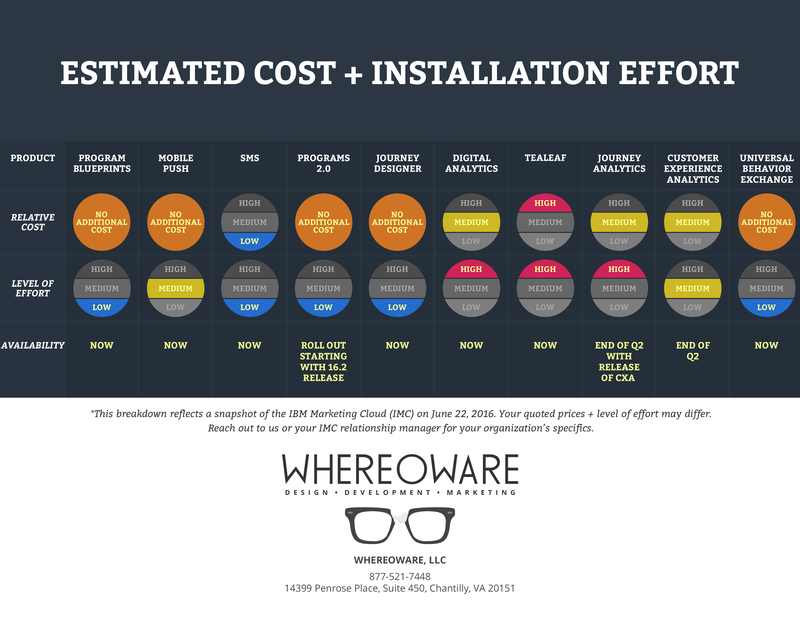 But if you need a refresher, check out the recording (below) + our IBM Marketing Cloud Cost and Effort handout (here). We’ve taken our extensive Silverpop experience (eight years using the tool and 19 Silverpop Certified Pros) and developed a step-by-step Silverpop Email Build Guide to help you learn your way around the tool. We go over the basics of designing, building, testing, and sending emails, cover email best practices, and recommend checklists to help you create emails that convert customers. We’ve all been there – you register in advance for a terrific webinar, but then life happens, and you miss it. You plan on listening to the recording, but just can’t squeeze in that hour of time. Don’t worry – we’re attending webinars left and right to summarize the key points for you. Let’s learn from industry rock stars together. Companies are striving to differentiate themselves within extremely crowded and competitive markets. One way industry leaders get ahead is tapping into their brand’s inner circle – the few diehard, repeat customers, who always open their messages. According to Dave and in theme with the e-card (right), consumers build lasting relationships with only about 5 brands at a time. These select few are considered “best friend brands” that consumers are happy to engage with on a regular basis. Email is smarter and more effective today – it’s ultimately a channel of conversion and a powerful relationship-building tool. How can you leverage email to nurture your super fans, so they accept you into their inner circle? 1) Be relevant – send messages based on individual customer’s interests and behavior. 2) Be trustworthy – respect your email list. Your actions need to be consistent with your messaging. Don’t over-send, spam, or share email addresses with third parties. This week, we welcome a guest post from one of our Senior Online Marketing Managers, Aaron Lemley. Aaron is Silverpop Certified and takes a creative approach to implementing high-performing email campaigns. Here, he discusses: how to setup automated behavior updates, and why these Silverpop system fields can make your next campaign more successful. Let’s take a closer look. At Whereoware, we’re always looking for new ways to leverage customer behavior in our email campaigns. If you’re new to Silverpop, or looking to use more behavior-based criteria in your next mailing, we recommend you setup automated behavior updates. Once setup, these system fields allow you to target customers based on the last time they opened an email, clicked a link in an email, or were sent an email. You can imagine the various applications of automated behavior updates – as a safeguard to reduce message fatigue (ex. contact has not been sent an email in the past two days); to target inactive customers with reengagement campaigns (ex. We miss you! ); and to better score your leads (ex. contact has clicked in the past week). You can setup this Silverpop feature in just five minutes. Download our Silverpop How To: setting up + using automated behavior updates to take your email campaigns to the next level. For more information on this topic please consult the Silverpop Knowledge base. Have any questions for Aaron? Let us hear them! ATLANTA, May 23, 2013 – Silverpop, the only digital marketing technology provider that unifies marketing automation, email, mobile and social, today announces its 2013 North American Partners of the Year. The awards were presented at Amplify, Silverpop’s eleventh annual customer conference, in front of more than 700 customers and partners. The awards went to EPiServer for technology partner of the year, Maritz Loyalty Marketing for agency partner of the year and Whereoware for consulting partner of the year.